Right let's leave it there. Not sure we have learned too much today, that we didn't already know. One club's future looks a lot brighter than it did earlier in the season, the other looks doomed. See you soon and safe journey home if you've been at the game. Aston Villa caretaker boss Eric Black on BT Sport: "We are under no illusions that the problems are running deeper. The fans need to see some kind of effort, there was a certain amount of that, but the quality lets them down. You would have to ask the players if they have shown enough fight. I've spoken to the players. "The club have to rebuild, we have come to stage where we are altering certain things in the club and we have to come back. When the team is bottom of the league, I can understand the disconnect with the supporters. We have to give the supporters something, not the other way round. It's been a hard season for them." Chelsea goalscorer Ruben Loftus-Cheek on BT Sport: "The whole team did really well, and well done to Alex for getting his first goal." Debutant goalscorer Alexandre Pato: "I'm so happy today. I'm very surprised, I was told I could go on. During the game, it was very easy to play alongside the guys. I'm tired but happy." While I almost wrap this one up, I can point you to the match report of the game from our own Mike Henson. "In the last few games I'd take these foreign mercenaries out of the Villa team. "I'd give the responsibility to younger players with a view on next season. The crowd would get behind six or seven new faces coming in from the Villa under-21s. They may even get a couple of results, which will give the fans great heart." The sight of all the "proud history, what future?" placards crumpled on the floor at the foot of the Holte End is an abiding image which describes the day a lot better than I can. "The game ran away from Villa. They started not too badly and were reasonable for the first 20 minutes, but then the mist descended. In the end it became embarrassing. An insipid performance, and people will look to the lack of quality and the lack of fight. "I just feel sorry for this club. Desolation on the terraces and desperation on the pitch. This is such a sad club at the moment." Plenty of finger pointing going on. Jack Grealish at least gets some applause for going up to the Villa fans and thanking them for their support. But it comes to nothing. All over. Not many boos at the end, it's past that stage. Plenty of empty blue seats. If I was ever designing a ground, I'd make the seats dark, just so it's no obvious when no-one is sitting in them. Hello. Villa win a corner. "I cannot understand players who are professionals not giving everything. "The fans have been spending a lot of money to watch Villa play, but the poor performances have lasted all season. The fans have every right to air their views." 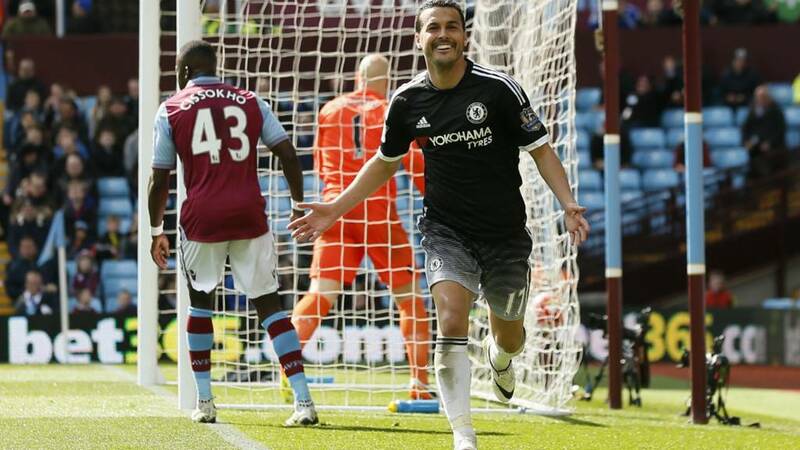 "There are Villa players who cannot cope with the demands of the Premier League. They are heading out of this league with a whimper. "And I actually have some sympathy for the players, because they have no leadership either on or off the field." Both sides going through the motions as three extra minutes are held up. Time enough. "And yet Alan Hutton gets applauded off by the Villa fans. That suggests he's one of the few home players the fans haven't got a problem with..."
Jack Greaslish is now booked for a hasty tackle on Baba Rahman. After Villa clear the danger, Grealish then volleys an effort at the back post but Thibaut Courtois sees it out. "The fans in the Holt End have turned their placards into paper aeroplanes. They are throwing them as far as they can towards the pitch, and then just like Aston Villa themselves they nosedive..."
It goes from bad to worse for Villa. Alan Hutton receives his second booking for a heavy challenge on Ruben Loftus-Cheek, who was also pressured by Jordan Lyden. Villa down to 10 men. Villa should have a corner as Jordan Ayew makes his way down the left but they can't even win that. Jordan Lyden comes on for Villa's Idrissa Gueye as the placards rain down on the pitch. "It's very difficult for a foreign owner who doesn't understand English football and isn't here on the ground. Unless you've got very good people working for you I can see how mismanagement creeps in."